[prMac.com] The popular R-U-ON monitoring platform has added another building block to its commitment for "anywhere monitoring". Users can now access R-U-ON data from their iPhone by browsing to the mobile section of the R-U-ON site http://www.r-u-on.com . The site detects the iPhone and optimizes the widget display for the superior rendering capabilities and screen size the device offers. The iPhone optimized web widget joins the large array of existing R-U-ON access methods. All alerts and status indications are available via RSS feeds, Mac Dashboard Widget, Google gadget,Vista Sidebar gadget and more. R-U-ON is an Atlanta based startup providing a simple, cost-effective and pleasant IT monitoring solution. 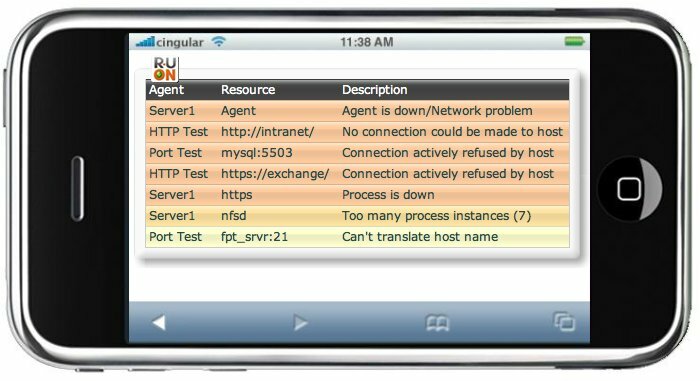 The R-U-ON platform is hosted and agent-based. It is optimized for the use of off-premise monitoring making it ideal for IT service providers and software/hardware vendors. R-U-ON leverages its hosted architecture to provide various data-feed channels such as RSS, email and Widgets/Gadgets for most popular platforms. At the time or writing, R-U-ON provides monitoring services for 10,000 users.